The ultimate joy for most artists is to see their paintings adorn the walls of a buyer's home or business. When possible, Chris Rogers obtains photographs of her work at its resident location to share with you. After remodeling their condo in soft, warm neutral tones, Connie and Dean Barrik chose "Yellow-Orange Composition" from my Abstract Impressions gallery for their dining area. "The colors are perfect," Connie told me, "but it's shown on your website as a vertical. Can it be hung horizontally without destroying your original concept?" Of course! A non-representational abstract is based on design, and therefore can be viewed from any angle. Mounted now on her dining room wall in Billings, Montana, it's perfectly at home. "Boys on the Beach" adds a striking accent to this collector's home. 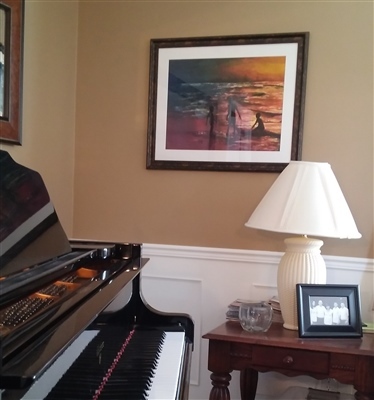 Positioned above the grand piano, it encapsulates the area's warm wood tones and accessories. When Kelly and Lorne Morris chose the sunrise painting of "Boys on the Beach" to accent this small bathroom, they decided to also use it as the color source for towels, decantors and other accessories. Selectively choosing the cool blues of the painting, the Morrises easily coordinated paint, tile and accessories to create a tranquil bath setting. 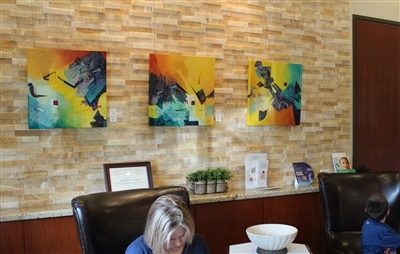 Abstract art is exceedingly at home in commercial settings. Light warm-toned rock and dark, warm wood provide an excellent background for this richly textured and colorful tryptic, inviting visitors to wait in comfort.